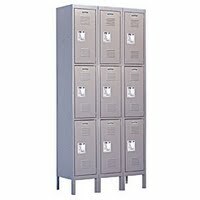 1) What is the minimum number of Metal Three Tier Lockers that can be ordered? A single unit of a Metal Three Tier Locker can be ordered. Or a single unit of a 3-wide Metal Three Tier Locker can be ordered. 2) Can a Metal Three Tier Locker be used to store things like janitorial supplies? Yes, these lockers are multi-use and can be used to store a large number of items. 3) What is the size of the Metal Three Tier Lockers? The Metal Three Tier Lockers can be either 5 or 6 feet in height. Their width is 12 inches and the depth can be 12, 15, or 18 inches.